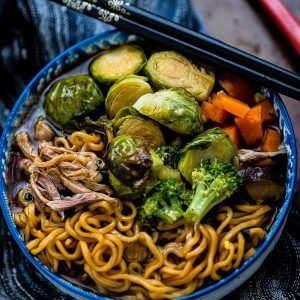 Turkey Ramen Noodle Soup is an easy and comforting dish to use up your leftover Turkey and veggie side dishes from Thanksgiving. My love for soups come from my mom. She made the most comforting and flavorful soups. Even though some nights she wouldn’t get home from work until it was almost time for supper, she somehow managed to make a multicourse meal from scratch making sure that there was always some sort of soup on the menu every night. Sometimes, we would make an entire meal out of soup by adding noodles or rice into the broth as well. This Turkey Ramen Noodle Soup is similar to something she used to make and it’s the perfect dish to use up all those Thanksgiving turkey and veggie leftovers. Plus it’s so simple to make because after weeks of prepping and cooking for the big Turkey feast, easy and fuss-free is totally what we’re going for. We start off with either turkey stock or chicken broth and bring it to a boil along with some Thai Red Curry paste. Once it simmers, throw in some leftover turkey or chicken along with those roasted veggies you have – I used roasted carrots, brussels sprouts, and broccoli. And just because, I topped mine with some shitake mushroom slices and a runny egg to make this even more jam-packed with flavor. Just before serving, toss in a handful of cilantro and a sprinkling of fresh lime juice to balance out the aromatic features . A comforting bowl of ramen noodle soup with Thai red curry paste. 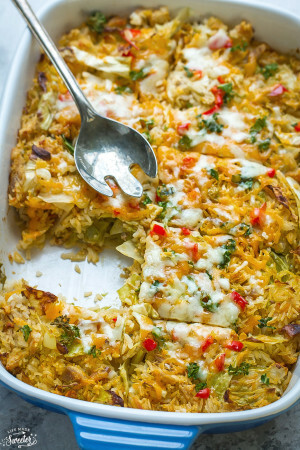 It's a great way to use up your leftover Turkey and veggie side dishes from Thanksgiving. In a large pot, bring the broth, red curry paste, garlic and ginger to a boil on medium-high heat. Toss in dried or fresh ramen noodles. Bring the pot to a boil and allow to simmer for 3 minutes. Stir occasionally. Toss in the kale and allow to wilt for about a minute. Add the roasted carrots, brussels sprouts, broccoli, shitake mushrooms and/or any other vegetables you have leftover. Add cilantro and lime juice. Season with salt and pepper to taste. Divide into bowls and top with soft-boiled eggs. *You can easily substitute meats to this curry like chicken, beef or shrimp. Feel free to add other ingredients like bell peppers, tofu, squash or sweet potatoes. I could eat soup just about everyday, as I love it that much! This soup looks so flavorful, Kelly! I love that you used ramen noodles and flavored it with red curry paste. I’ve never tried that before, so I’m loving the flavor it adds to this soup. What a perfect bowl of comfort food! Pinned! This is stunning Kelly! I love ramen noodles, and soup, and fall Perfect! Soup is my all-time favorite meal! (After dessert, of course.) This looks so delicious! And curried soup is so amazing in the cold weather for warming you up right away 🙂 It’s my favorite. Usually my boyfriend makes the soup because he’s a natural; he doesn’t need a recipe. But I’m so happy to see this recipe because now I can make it! Yay! I love homemade ramen! And with all the veggies and curry this looks perfect!! Bravo! I feel chilled to the bone right now…how I’d love to have a bowl of this in front of me! I love that you can use instant ramen noodles but make it so much better with your own soup base and add-ins.. Adding the chickpeas and squash is such a great way to bulk it up in a healthy way, too. I want some!! : ) And I recently bought some green curry paste and was thinking about ways to use these kinds of pastes in general. This is a wonderful idea. I’m also really into soup right now. Making chicken noodle today with some leftovers. Soup noodles need to be next! You are so right Kelly – nothing beats a “hot comforting bowl of noodle sou that is perfect for chilly fall nights to warm up your belly and hearts”! Love your addition of Thai Red Curry paste to the stock! I love meals in a bowl! Thanks so much for sharing! Kelly, we love soup here too! My mom always seemed to have a pot of some sort of stew or soup for us several times a week when I was growing up:) We’ll be trying this soon, as I just bought some red curry at the international grocery store last week. Thanks for sharing, Kelly! I’ve been wanting to make my own ramen soup — this looks fantastic with all of those fall flavors with a kick from the red curry paste! This would be perfect with turkey leftovers. I love this! This soup looks so delicious! Love the noodles and it’s such a great way to use up those leftovers we’ll all be having soon! This soup looks so filling and tasty! I love how much stuff is in it! Definitely a great way to use up turkey leftovers, I will definitely need to try it next time we make a turkey! Kelly, I LOVE this recipe so much!!!! I love using my dried ramen noodles!!! 😛 A comforting bowl of ramen noodle soup with Thai red curry paste?!! 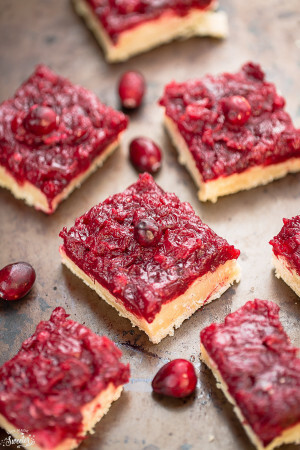 love love love and love the suggestion to make this with leftover turkey. . brilliant!!! I love, love, love that you made your own seasoning/broth, Kelly! You rock! And the flavor must be so amazing here, I can just imagine it!!! 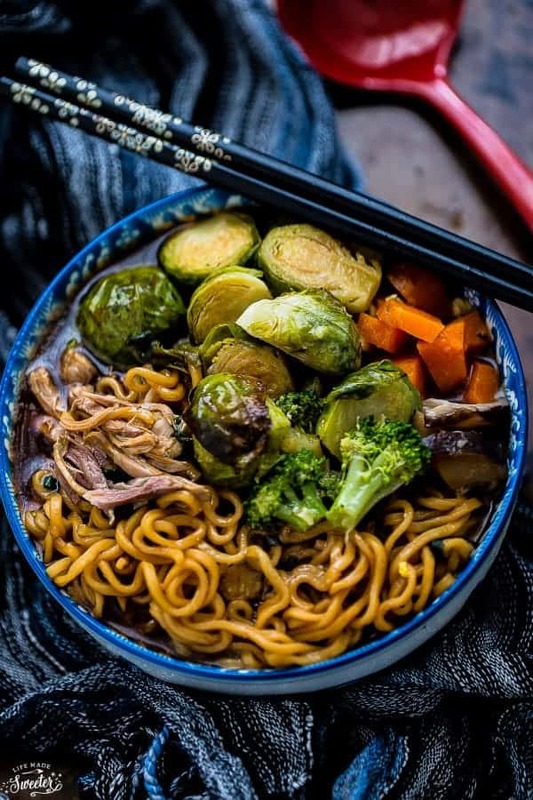 You have such a unique take on Ramen – love your creativity! Such a hearty, colorful bowl, too. It’s true what they say, you eat with your eyes first. Lovely work, Kelly! Mmm… so yummy!! The best part of fall and winter is the chance we have to have soup as much as we can. I love noodle soups and red curry is one of my favorites! I love any and all soups. And when you combine it with noodles?? Even better! This sounds fantastic Kelly! I think I got my love of soup from my mom too! She would always have it around at our house growing up. This soup looks amazing Kelly and your pictures are perfect! What a great way to turn leftovers into a totally different meal with completely different flavors. Love it! Yum I love ramen and I love that you encourage us to use thanksgiving leftovers! OMG, everything about this soup sounds absolutely delicious! The fall flavors, the curry, the ramen! You have totally outdone yourself, Kelly! Pinned! What a great idea! This sounds delicious and comforting. And I’m always looking for ways to use ramen without the seasoning packets. This will definitely be on my ‘most creative’ list for Thanksgiving leftovers! Thank you! I don’t know that we’ll have any Thanksgiving leftovers this year since it’s TWO DAYS before the wedding…but I’m going to make this soup sans turkey regardless. Love the Thai curry flavor paired with butternut! Oh man, this is like my ultimate comfort food! Love LOVE all the veggies you packed inside with the ramen noodles. I am like you Kelly, I could honestly eat soup year round and be one happy camper! Though it does show up much more around this time of year! I cannot wait to try a veggie version of this recipe – it sounds like the perfect complete and comforting meal!!! My husband is half Korean and he introduced me to real authentic spicy ramen. I have been hooked ever since! I’ve yet to make it myself though. Your recipe is a great starting point. Thanks for sharing! Love, love, love this! 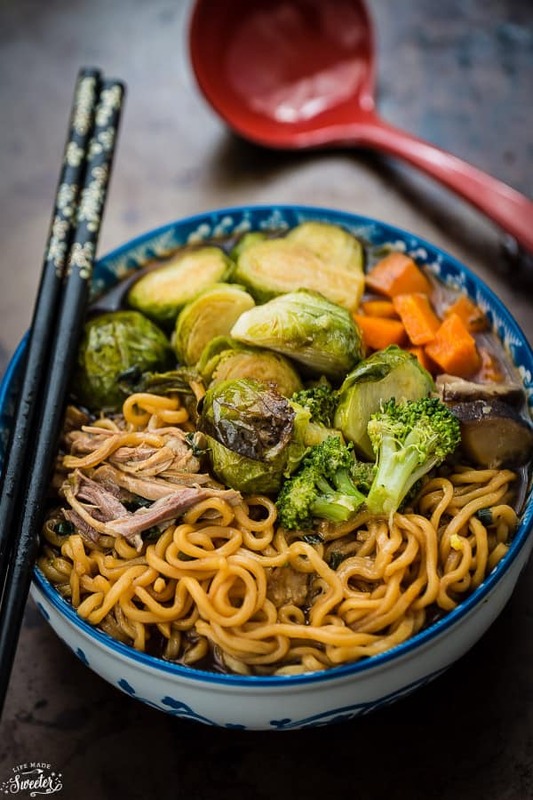 Putting a Thanksgiving spin on Ramen – I am totally and completely on board. I seriously cannot wait to hold a bowl of this in my hands! Girl it’s breakfast time and all I want to stuff my face with is this wonderful warm cozy bowl of ramen!! Kelly, I need this for dinner in a MAJOR way 🙂 I love all soup but curry types are my favorite, especially when noodles are involved. Putting this on the weekly menu and can’t wait to try it! Spicy, salty, sweet and sour … that’s a flavour party, Kelly. The noodle soup looks like a pure comfort treat for the season. Hi Kelly, I love soup, especially this one, this has all my favorites! Kelly… this is AMAZING!!!! My wife and I are on such a huge ramen kick right now. There are all these amazing ramen places in NYC that we love to hit up, especially in these colder months… and now we can make this crazy inventive creative one at home?! #winning! I absolutely LOVE all things Thai and soup in these cooler months is a must! This looks so deliciously tempting. Pinned! Ahh, you’ve found my two favorite things ever: ramen and Thai food, and put them together in one super incredible looking dish! LOVE! I’m always on a hunt for new soup recipes! Ramen turkey soup sounds great for the cold weather out there! I love how you shared a left over Thanksgiving recipe idea, before Thanksgiving! Pinned! This is just amazing!! Perfect chilly day soup…with a little heat!! You’re right – nothing beats a comforting bowl of noodle soup, and this looks amazing! Your photography is beautiful too Kelly! Pinned! I love using Ramen in recipes! I’m kind of a dork like that 🙂 This looks amazing! Now this brings Ramen to a whole new level! Yum! 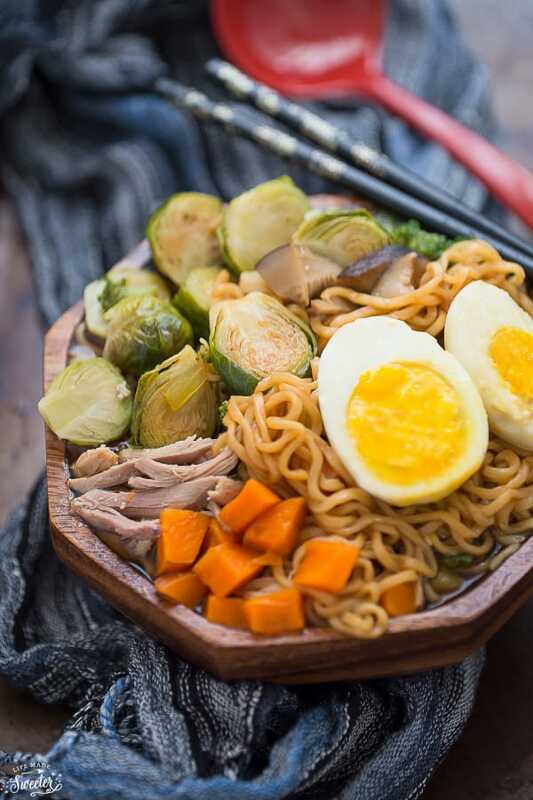 Craving a bowl of this ramen to devour right now.. it looks so delicious, flavoursome and comforting Kelly! I’ve never had a ramen with a red curry before, but it does sound so comforting! This bowl of ramen soup looks delicious and colorful. Pinning! Now this is ramen soup kicked up a few notches! Gorgeous and so tasty!!! I could use a cup of soup daily! I try to make it once a week in the winter. This will absolutely be making an appearance! Love all the winter veggies and the red curry!!! I happen to have red curry paste in my cupboard and I don’t actually know what to do with it. Problem solved! wow, damn delicious and comforting noodle!!! great captured as usual Kelly….. I would definitely pick this ramen dish over any other Thanksgiving meal! I absolutely love ramen! What a hearty yummy soup!